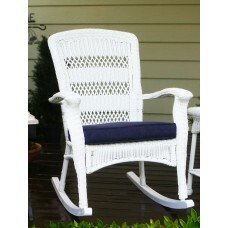 Classic wicker rocking chair, 3 colors available. 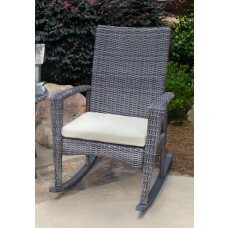 Plantation rocker in 3 colors, from the Portside collection. Available unfinished or your choice of 6 colors. Factory assembled and made in the U.S.A! An all-weather outdoor rocking chair. How do you choose the right rocking chair? That's a great question! First, you think about how you're going to use it. Are you envisioning long evenings dozing in front of the fire? Are you planning to watch the world go by from the comfort of your front porch? Will these chairs be the perfect addition to an outdoor room? 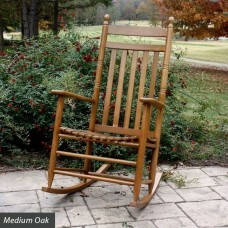 Or are you placing your rocking chair in the nursery for some baby bonding time? Next, think about sizes and colors. You'll want to choose a chair which fits comfortably into your existing life. Finally, think about style. 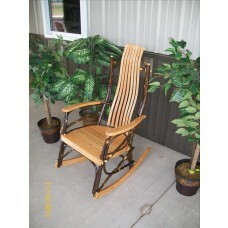 Do you want a rocking chair which sits up straight, or do you want one which very gently reclines to support your back? 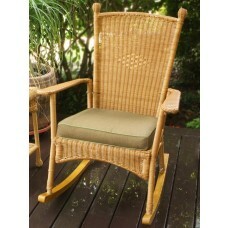 Do you feel more comfortable with a woven chair back, or are classic slats just fine by you? We've got plenty of options no matter what your preferences are. Just click on any of the chairs above to learn more about your new classic rocking chair!